As a young couple enters the sacred institution of marriage, anticipating a new life, new roles and a new household, a humble yet revered image of the tribal deity is enshrined in the new home, before anything else. Sculpted by the local metal craftsman, the brass figurine embodies the tribal traditions and beliefs of the Gonds of Betul, Madhya Pradesh. 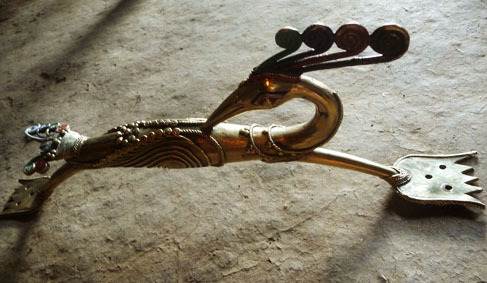 Dhokra, locally known as “Bharai kaam”, is the art of sculpting brass with the ancient technique of lost wax casting. Practiced in West Bengal, Orissa and Madhya Pradesh, this metal craft finds different forms of expressions with the different tribes and traditions. 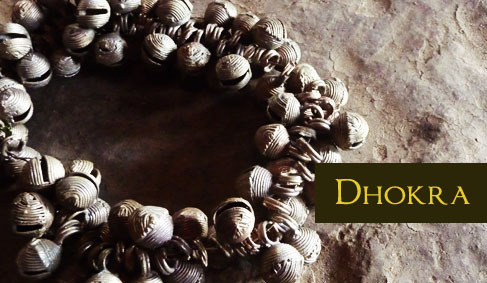 Although Dhokra work involves casting molten metal in moulds, each piece is unique, as for every piece its own mould is made. A mixture of natural beeswax and saras, a kind of gum, is boiled to a thick paste like consistency and pressed through a sieve, to get fine noodle like threads. The unique property of natural beeswax allows it to remain flexible even when it cools down, so it can be turned and coiled in very small shapes. 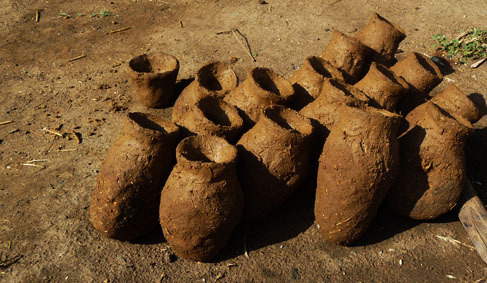 A base form is made using mud and cow dung mixture. Over this, the wax threads are coiled in the desired shape of the final piece. Sometimes spirals,sometimes cross hatched, or sometimes smoothened into flat surfaces, the texture of the wax threads will determine the final appearance of the metal. A thin coat of very fine mud covers the wax, over which a final coat of mud mixed with cow dung and hay is applied. Holes for letting melted metal in and liquid wax out, are made into the mud covering. This is dried in shade for a couple of days and then baked in a furnace. The heat melts the wax and bakes the mud, thus forming a mould in which molten brass is poured. After the metal cools and hardens, thebaked mud is broken to reveal threads of brass composed in the form of beautiful figures and artefacts. Cleaning and polishing may be done with a brush, to achieve a shiny metallic surface. Figures of elephants, horses, cattle and peacocks, utensils and jewellery are made by the craftsman, known as “Bhareva”, or “one who fills”. Following the typical folk style of this area, the cattle bell is one of the oldest objects made by this technique. 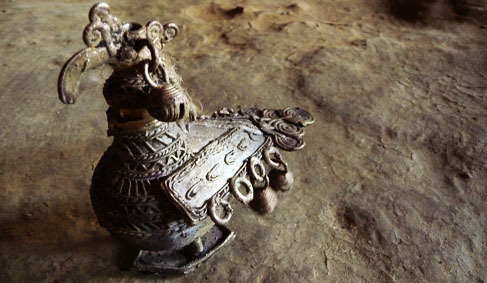 The bell is even worshipped as a god by some Gonds, its sweet sound symbolizing cattle and hence, prosperity. The oil wick lamp is another very important ritualistic object which has now taken diverse ornamental forms. 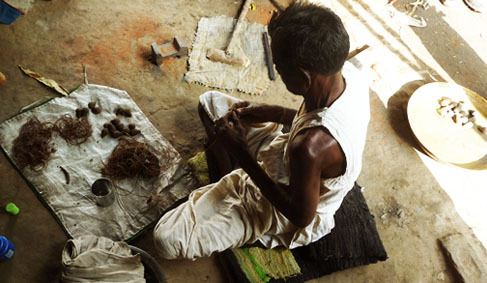 When Madhya Pradesh and Chhattisgarh became two states, most of the area where skilled Dhokra craftsmen lived, went to Chhatisgarh. It was then that Madhya Pradesh Hastshilp Vikas Nigam started a Dhokra facility in Betul, to continue this craft in the state. 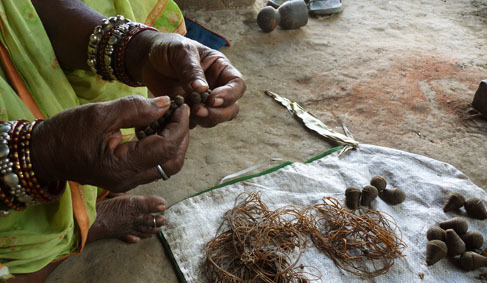 Today, many craftsmen learn and practice this tribal art form at the centre, to create their traditional objects as well as commercial artifacts for the bigger market. 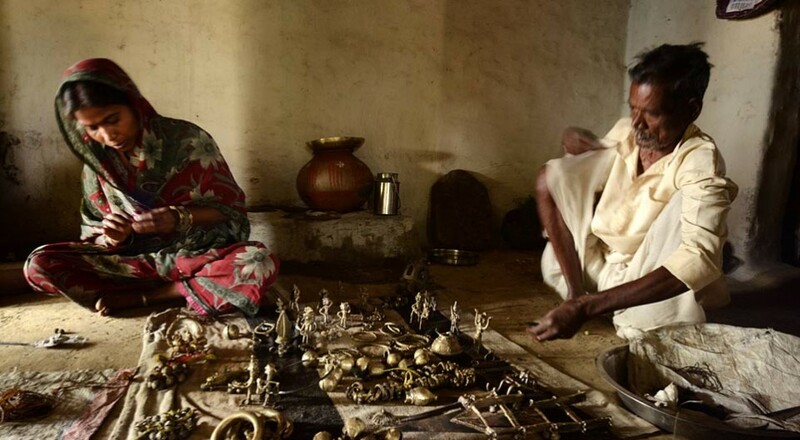 On one hand, this ageless tribal craft is getting international acclaim for its pure folk motifs and figures, while on the other hand, rising prices of raw material is throwing new challenges to the survival of this art. Yet, along with the essential objects of ritual use, the craftsmen also make accessories and decorative items for urban interiors, using their folk aesthetic sensibilities, thus giving a wonderful touch of tribal art against a contemporary backdrop.